Mom’s Homemade Buttermilk Biscuits are tender, buttery and have a slightly crisp outer layer and are fluffy, hot and steamy on the inside. Saving money by making homemade never was so delicious! 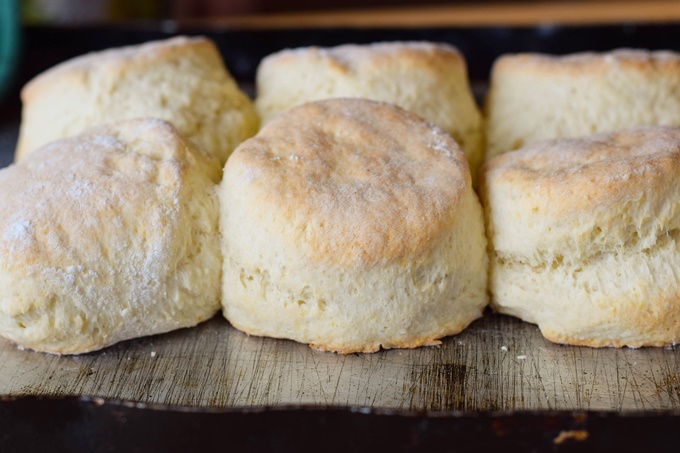 Serve these mouthwatering biscuits warm with butter and honey, along with some sausage gravy, or with some fresh chopped strawberries and whipped cream! 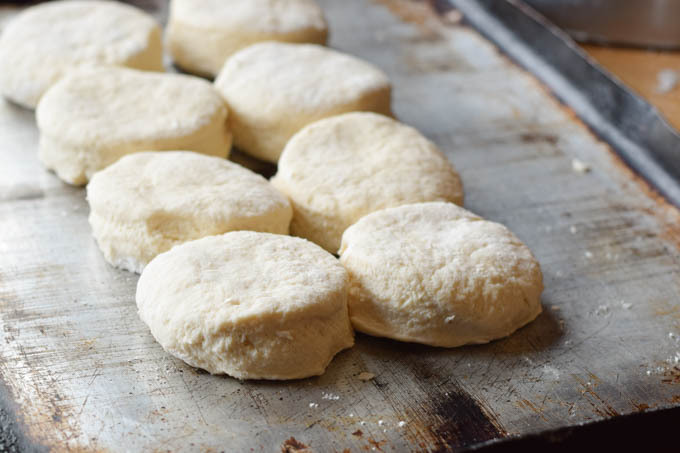 Homemade Buttermilk Biscuits aren’t a meal, but believe me, I could make them one! 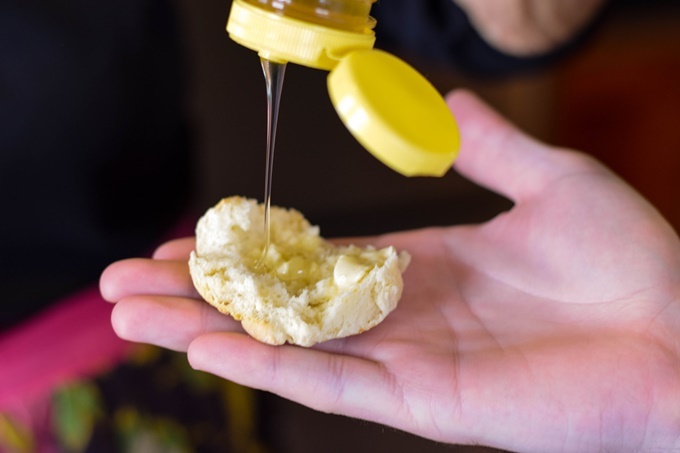 Just slather with some butter and honey, give me some hot coffee and I’m good to go! These biscuits are much better than the ones you will ever get in a can. They will taste better and are far more budget friendly! My desire to document family recipes is very strong. I want my children and other family members to have those recipe and photos at their fingertips. 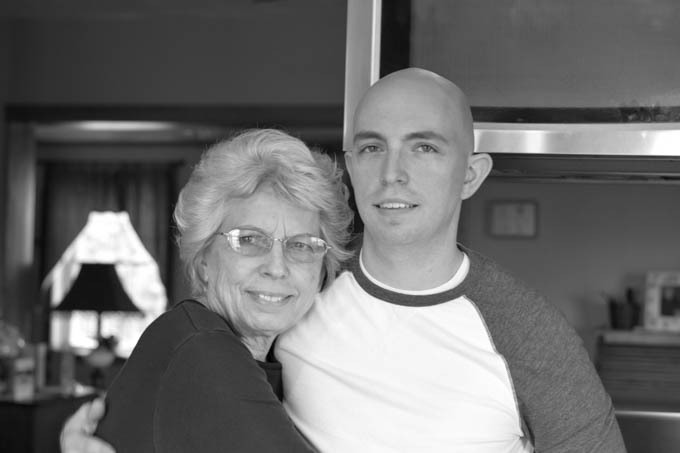 So, prior to my visit back home, as always, I was thinking about recipes mom made that I loved and could document. Mom’s homemade buttermilk biscuit making skills were one thing I felt needed to be shared. So, my oldest son and I spent a day with her to do so! Another reason I wanted to document mom’s step by step recipe, is because I have never been able to make my own biscuits as good as hers. And, buying those biscuits in a can just don’t cut it. They don’t taste like homemade to me and definitely aren’t worth the money you pay for them. 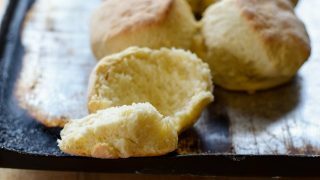 What kind of fat do you use to make buttermilk biscuits? If you want flaky, use shortening. If you want flavor, use butter. Dad and Mom have moved on to other fat alternatives and they now use Smart Balance Margarine. However, if you have shortening and/or butter then your good to go. Use a combination of both or just one of them. Use what you have in your house, you will be fine. 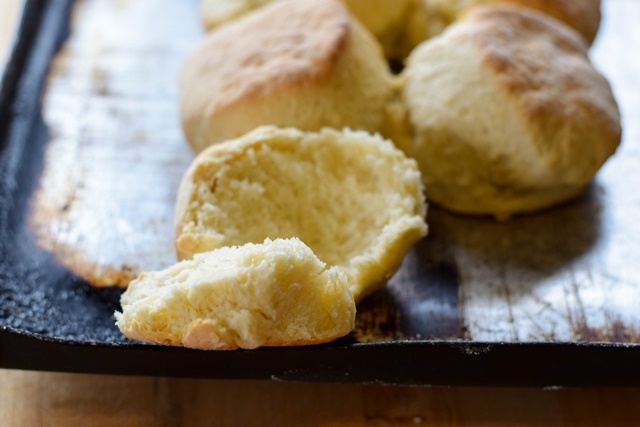 Why do you use buttermilk in biscuits? Buttermilk has an acidity to it that helps the biscuits to rise and makes them more tender. If you don’t have buttermilk, you can easily make your own. Just pour 1 tablespoon of white vinegar or lemon juice into your measuring cup, then add your milk. Let it sit for a few minutes. You will see the milk begin to curdle. Then, just add it to your recipe as you would the buttermilk. Do I have to sift the flour for my biscuits? It is wise to sift your flour. When sitting, flour gets compacted. You want your flour to be light and airy. Sifting it will do so. If you don’t have a flour sifter, you can easily sift by using a whisk to stir the flour first. Why did my biscuits turn out tough? There are a few reasons your biscuits could be tough. First, you either didn’t sift your flour, or you packed the flour in tight when measuring in your measuring cup. 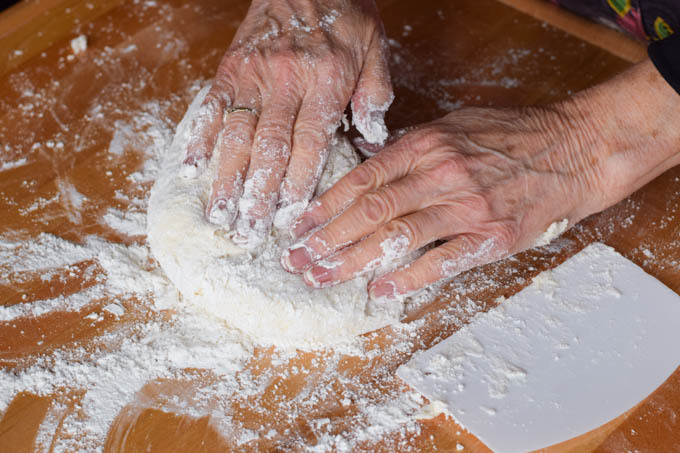 Second, you could have overworked the dough, Mom’s advice: sift, then lightly spoon the flour into your measuring cup and don’t use a rolling pin, just pat the dough with your hands. Biscuits the way Mom makes them! 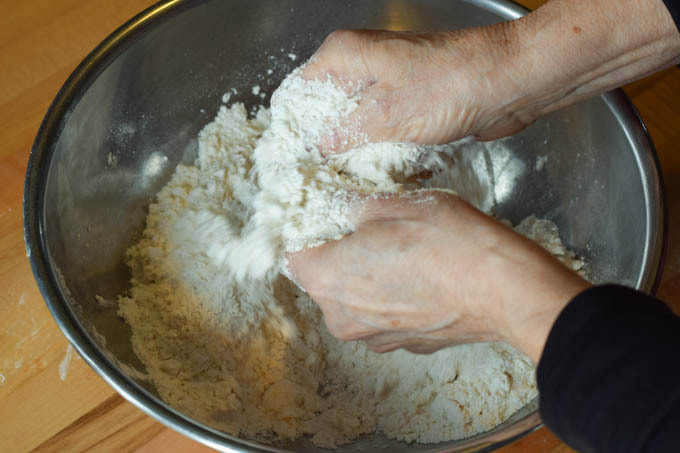 Mom’s Homemade Buttermilk Biscuits, step by step instructions directly from Mom! Sift your flour then measure it using a spoon to scoop it lightly into your measuring cup. Add the remaining dry ingredients and using a whisk, blend them together. Using your hands or a pastry blender, quickly work the fat into the flour mixture until it resembles little pea sized crumbles. Make a well in the center of your flour and butter mixture. Add the buttermilk and stir until just combined. 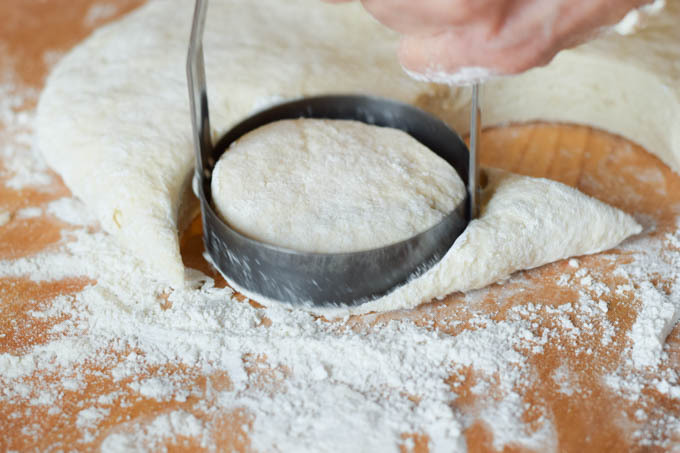 Turn your buttermilk biscuit dough out onto a floured board. 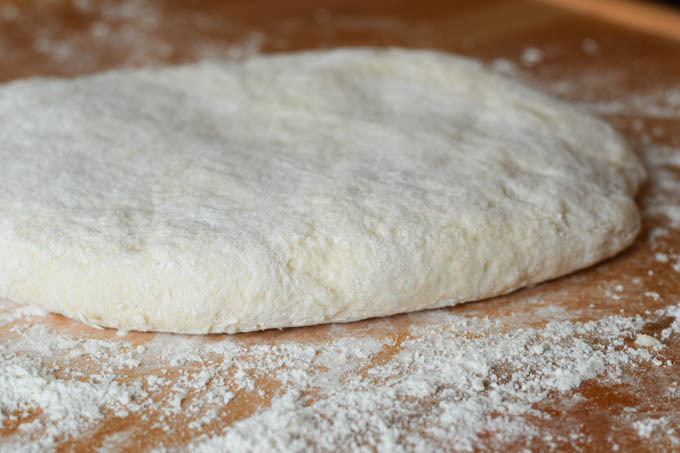 Place your biscuit dough on a floured board and lightly pat your dough down with your hands until it is about 1″ thick. Place biscuits close together on a ungreased baking sheet. They should “just” be touching one another. Mom states that leaving the grease OFF the baking sheet allows the bottoms of your biscuits to get crispy. They shouldn’t stick to the pan because of the amount of fat in the dough. Bake until golden brown. Approximately 15 minutes. As my son states, this is the best part! He says, “As soon as they come out of the oven, taste it to make sure it is good.” I love how these great tips are passed down to generations! Spending quality family time together. The best part of putting this recipe guide together for you was the fact that 3 generations got together to recreate this recipe. My mom has been cooking and baking since a very early age as Nanny was quite ill during Mom’s teen years. So, she has a lot of experience! I love that I am able to preserve these recipes with her and my own children! I love my mom’s biscuit cutter. So much so, I HAD to have my own! It is perfect to use for cutting out biscuits and cut out cookies! 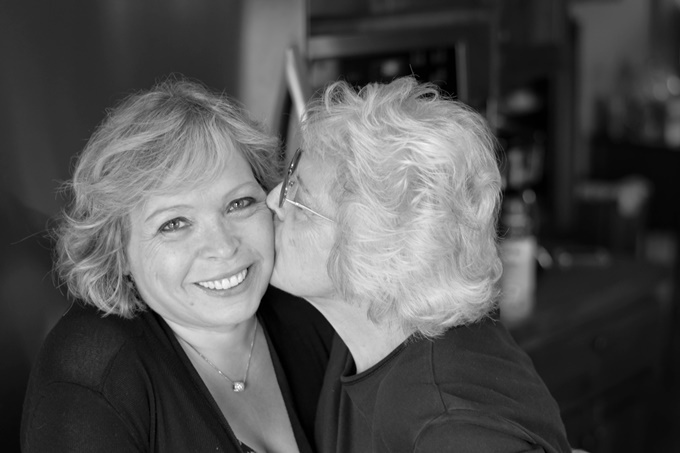 The one in the photos I share with you is the same biscuit cutter she has had ALL of my years – and that’s well over 50. I think it is the best tool out there for biscuits and cookies! 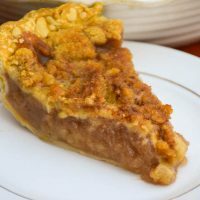 Mom's recipe to reserve your own homemade apple pie filling to use throughout the year! Mom’s Rhubarb Sauce Recipe is sweet, tangy and perfect for topping buttered toast, served over top of ice cream, or even to top your grilled chicken! 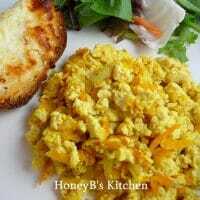 Mom's vegan recipe for scrambled eggs, with tofu! 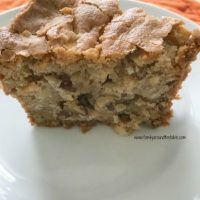 My Mom's out of this world apple cake is moist and delicious. The perfect balance of sweet and tart. Serve this for breakfast or dessert. The recipe from the back of a Post Raisin Bran Cereal Box - an old recipe with a lot of nostalgia attached! Mom's Homemade Buttermilk Biscuits, tall and flaky and perfect with butter, honey, with sausage and gravy, and with strawberries as shortcake! Preheat oven to 450. In large mixing bowl stir together the flour, baking powder, baking soda, salt, sugar, and cream of tartar. Be sure to sift flour before measuring. 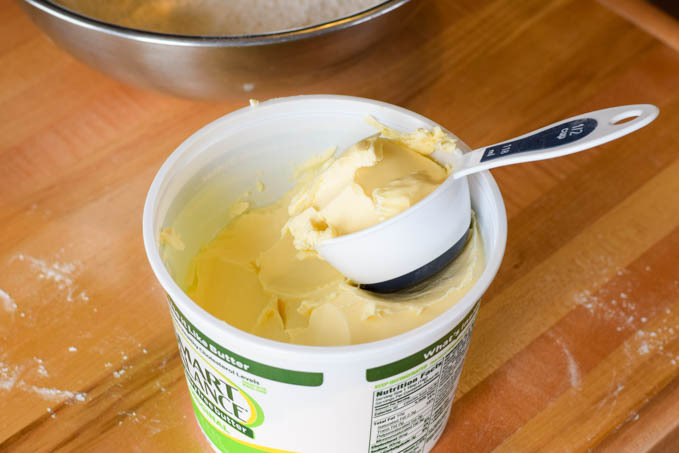 Using a pastry blender or your hands (as mom recommends) quickly cut the butter into the flour mixture until it resembles pea like crumbs. Turn dough out onto floured board. Knead 5-6 times to bring dough together. Flatten to about 1" thick using your hands. Cut with a biscuit cutter and place on baking sheet, being sure to have the biscuits touch each other slightly. Bake 10-14 minutes or until biscuits are golden. These look fabulous! I love making homemade biscuits, once you get the hang of it there’s no going back to store bought! What a special post! I loved reading this and your photography made me feel like I was in your mom’s kitchen. Thank you for sharing. Love that you documented your mom making them! I did something similar a few years ago when I documented my mom making banket. This inspires me to do more of those. These look terrific! One of my favorite things to make and eat! Your mom is so cute! She’s so nice too! Tell her I said HI! Oh, boy, these are the PERFECT biscuits! I’m going to use your mom’s tips to make my next batch!! Thanks for hosting this week! What a special way to share an old time favorite recipe. Straight from the heart. Made me think of the biscuits my grandfather made for us growing up. Fabulous photos and wonderful memories. And I’m with you, I could just eat biscuits for dinner. I am going to make these biscuits and I am going to include your Mom’s secret ingredient that you failed to mention in your tips. I am going to to add a dollop of love to these biscuits as I make, cut and bake them. What a lovely story. Biscuits are one of my favorite things but they are even better when you make them with someone you love. You have a beautiful blog! Shelby I love this post! I can’t wait to try making these with your moms tips! I can’t believe you’ve been blogging for 8 years! 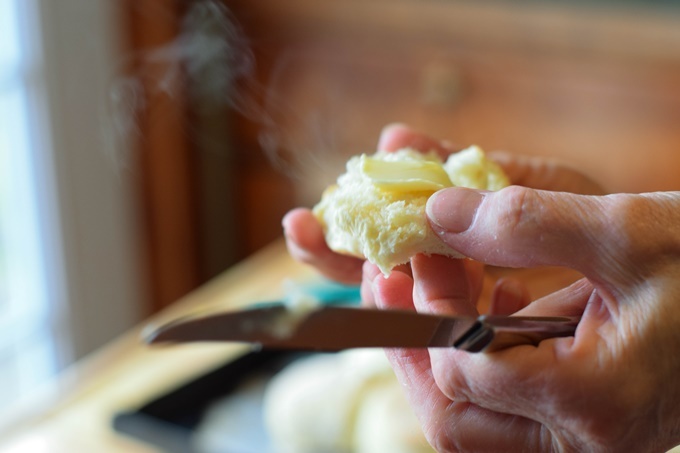 Great tips for making perfect biscuits! 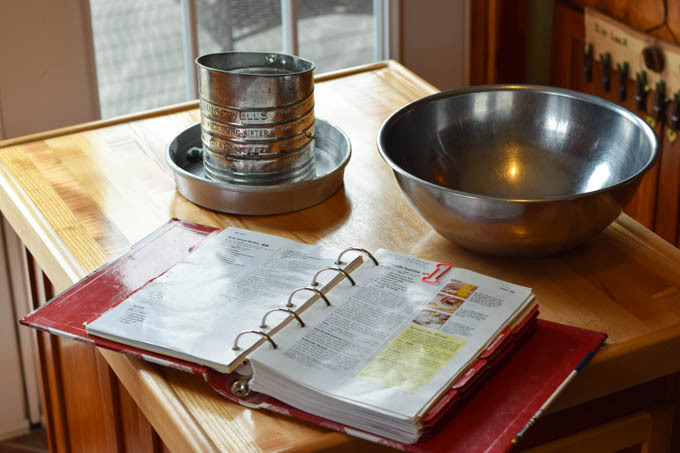 So cool that your family works together to preserve those family recipes! These look AMAZING! Miss homemade biscuits around here!